Which Tanpura Should One Use? One of the readers of the blog wrote to me recently about the usage of a real Tanpura versus electronic shruti boxes. I must say having a well tuned tanpura resonating near your ear helps in recognizing and consolidating harmonies (its the same reason why avergae singers sing a lot more in tune in a 4-part choir). 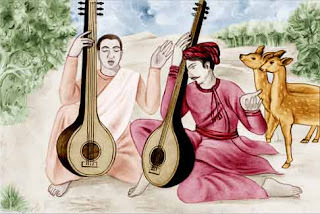 However, tuning, bridging and threading, apart from finger pressure and positioning, make tanpura playing an art; if you have not done it for a long time, it is not as easy to learn as it would seem. It might actually be quite cumbersome if you are in the middle of learning vocal technique. * Some of these recordings are not in perfect intonation relative to my keyboard, and might not match with your harmoniums either. But they are fine to sing along without any instruments or alternatively you can tune your instruments to these. You can also pitch shift them with music software if you have the inclination; I do that all the time! Singing takes a lot of concentration. I personally like the electronic versions of tanpuras especially for performance because of their convenience, volume control, stability of tone, and portability. However, for most classical recordings I tend to use either a real tanpura or a recording of one. Here are three recordings where I have used three different kinds: The first shabad (which was recently posted, so you might not have heard it), "Lost Time - Ab Main Kahaa Karaon Ri Mai," I use the recording of a real tanpura. In "Simro - Pearl of Bliss" I use an electronic tanpura. In "Four Blessings - Chaar Padaarath," we used a live tanpura as we recorded the shabad. Hope this helps! I know I have other questions to respond to; am working on them!